When a tax refund cheque arrives in the mail, it feels a little like Christmas morning. The money almost seems like a gift, even if you shouldn’t have paid it to the government in the first place. The temptation is to treat yourself – perhaps take a vacation or buy some new “toy” you’ve been hankering after. But there are more advantageous ways to use the money that will leave you and your family better off financially. Let’s look at some of them. Financial advisors agree that the best thing you can do with a tax refund is to pay off your credit card balances. If you have more than one outstanding credit card balance, repay the highest-cost debt first and go from there. For most people these debts, with the possible exception of student loans, are not tax-deductible so the next step is to pay them off, says Mastracci. That includes mortgages, even those with a low rate of interest. Unless you already have all the money you’ll need for retirement, the next step is to boost that nest egg. Providing that you have Registered Retirement Savings Plan (RRSP) contribution room left for the year, this is an excellent option, says Mastracci, since it will provide further tax savings when you claim the tax deduction in the future. 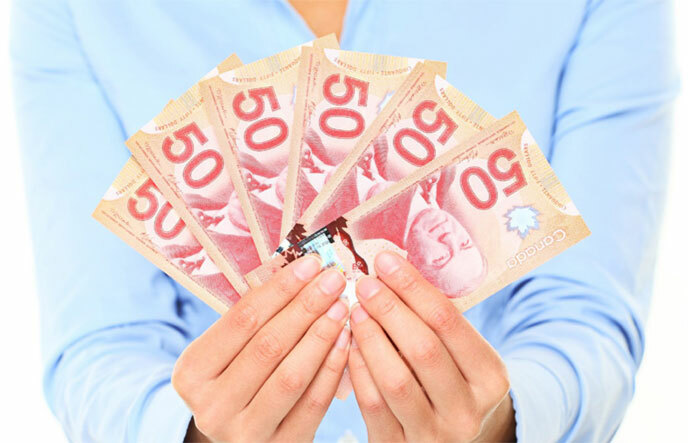 If you don’t have any RRSP contribution room left for this year, one alternative is to put the money into a tax-free savings account (TFSA). Unlike RRSPs, there is no tax deduction for a TFSA deposit. Investment income earned in a TFSA is not taxable and capital losses can’t be used as a deduction. You can withdraw the money whenever you wish but cash withdrawals can’t be re-deposited until the following year. 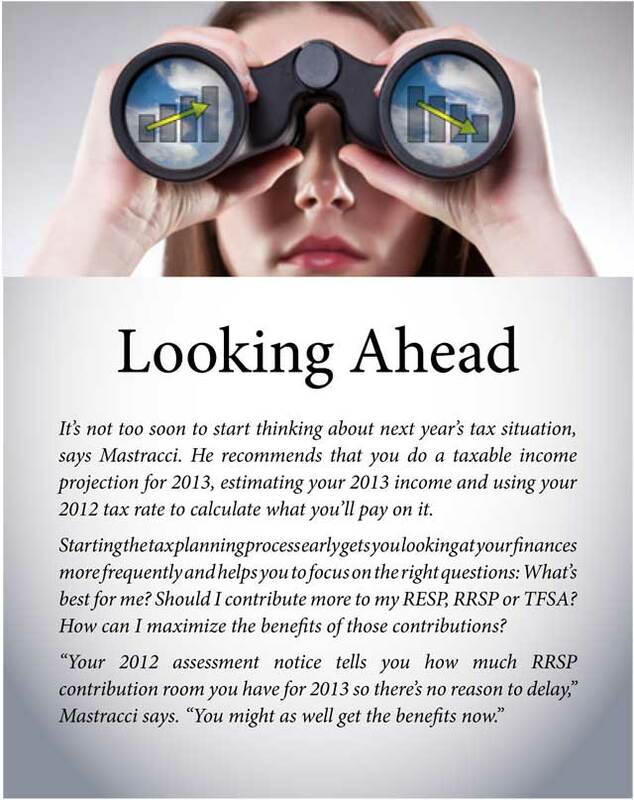 Envision:seeing beyond magazine talked about the relative merits of RRSPs and TFSAs in the January/February 2013 issue. Life is unpredictable so everyone needs an emergency fund. 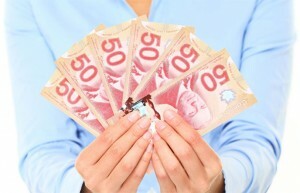 It should contain enough to cover three to six months’ worth of expenses, says Mastracci. “You need to be able to access the money quickly and easily, so invest in a high-interest savings account (one that allows you to withdraw the cash at a moment’s notice without penalty),” he adds. You can also use a TFSA as an emergency fund but the money must be invested in instruments that are flexible and liquid. If you and your spouse are in different tax brackets, loaning money to the partner in the lower bracket can save tax dollars, says Mastracci. The spouse in the higher tax bracket lends the money to his/her partner and charges the prescribed rate of interest (currently 1 per cent; you can lock in this rate indefinitely). The partner in the lower tax bracket then invests the money and pays any tax owing on it. He/she will have to pay interest to the spouse in the higher tax bracket each year by Jan. 30; the interest payment is tax-deductible. The costs of a post-secondary education are significant and contributing to a registered education savings plan (RESP) for your children or grandchildren can make a big difference. An RESP contribution also triggers Canada Education Savings Grants (CESGs) of 20 per cent on the first $2,500 invested in an RESP each year. That means an extra $500 annually per child if you contribute $2,500. The maximum lifetime CESG contribution is $7,200. What’s more, the 20 per cent CESG grant, along with any growth from the investment itself, is taxed in the child’s hands, not yours. You can do good while doing well for yourself by donating your tax refund to charity. If you haven’t made a charitable contribution previously, or not since 2007, you are entitled to the new enhanced donation tax credit introduced in the 2013 federal budget. It provides an additional 25 per cent in tax savings federally on your first $1,000 of donations. Spending some of that tax refund on a holiday or some other fun activity has its advantages, says Mastracci. If nothing else, it’s bound to make you popular with your family.